Arne Jacobsen (1902-1971), Danish architect and designer. Educated at the Royal Danish Academy of Fine Arts, School of Architecture in Copenhagen and professor at the Academy. Design Letters introduced a design series with typography hand drawn in 1937 by the world-renowned Danish Architect Arne Jacobsen. 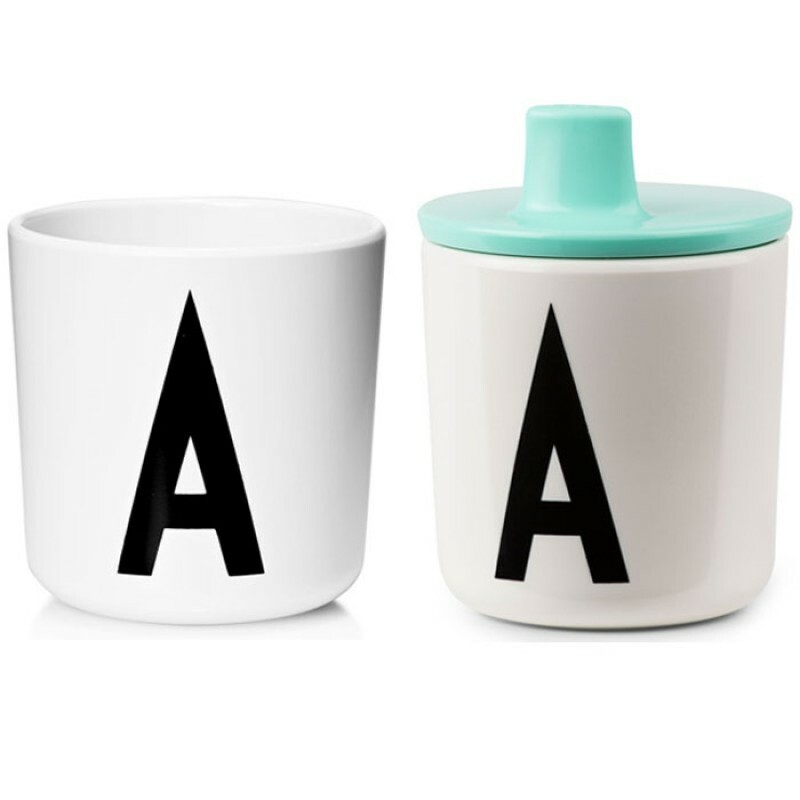 We stock the Arne Jacobsen Porcelain cups. In the spring of 2004, the design duo Christine Schwarzer and Anne Birgitte Balle decided to launch an innovative product line for children, with a goal to create positive and stimulating settings for imaginative play. RoomMate gives kids the mental and physical space for interaction, fantasy and absorption. The versatile and appealing designs are perfect for self-expression and creation across a wide range of ages. Since children invariably install themselves in every room of a house, RoomMate's products are scaled and coloured with other household furniture in mind; so even though they're meant for kids, their charm and quickness sits well in a grown-up environment. RoomMates collection includes HappyCat bean bags, Hippie Tipi play-tents and BigBone dog beds. Ingrid Reithaug and Tonje Holand are the women behind the label "Darling Clementine". They are inspired by Scandinavian heritage and driven by the desire to create things that make the every-day brighter! Don't miss out on their charming The Marionette Collection created for Ferm Living. Hanne Berzant is the co-founder and designer of by nord. Hanne has a formal education as Graphic Designer, with lots of experience as Art Director for leading Lifestyle magazines. A strong personal passion for design and home decoration has enabled Hanne to create the unique and visually very strong by Nord design universe. By Nord Danish design has throughout the years created several design icons. Simplicity, functionality and skilled manufacturing are the characteristics of Danish design, which in the shapes of e.g. furniture and home accessories are appreciated all over the world. By Nord design and produce timeless home accessories of high quality. Like the Danish two-star Michelin restaurant Noma, they are inspired by the diversity of the raw yet beautiful Nordic nature, where the rough and gentle meet.The inspiration from Nordic nature is very apparent in ByNord’s product range, which includes among others: bed linen with digital close up prints of wild animals, striking photo print cushions from the deep forest, colorful blankets in wool, tea towels and tea cosies By Nord believe in sustainable design, where beauty and functionality are supported by extended use of organic materials. Since the start 2014 Kreativitum has designed modern and stylish art prints and posters that appeal to all ages. Kreativitum you find photo posters, kids posters and graphic posters in different styles. Skandvis stock Kreativitum art prints and wall art, buy posters online at Skandivis. The Inspiration behind LOUISE ROE designs is often found in nature, as well as in vibrant city life. A combination of the two and their obvious contrasts give the designs tranquillity, energy and an edge. This is reflected in the highly organic choice of materials, colours and prints being used. Nature, and the rhythm and renewed life and energy it provides us with, is essential to us humans - it’s genuine and real! Pulsating and multi-faceted big city lifestyle is the other main source of inspiration behind the designs. Modern architecture and old buildings, speed and perfectionism, give a sense of history, life and creation. Check out her recent book photo print cushion design as well as the Archive Roll design. Mrs Mighetto was started in 2014 by Kram Malin and Anna Sylvan. Mrs Mighetto is based in Stockholm Sweden and creates prints, posters, wallpaper and Danish interior accessories for the nursery and children's rooms. Mrs Mighetto’s products are our beloved characters who all got their very own name and magical personalities. Products are made from original paintings in watercolour and have been described as products full of fantasy, history and mystery suitable for kids, and their parents. Mrs Mighetto Posters, buy your Skandi art and design posters at Skandivis. Playtype™ a foundry and online font shop was created by brand & design agency e-Types, as a showcase of more than 20 years of type design – from commissioned works to fonts created out of passion. Buy your Scandinavian posters online in the UK at Skandivis, see our selection of Playtype Typography Posters. Steam is the name Rikke Hagen has given to her futuristic table lamp, which communicates power in plenty. Steam plays with the basic form of the table lamp, but has been totally purged of all superfluous detail. Rikke Hagen qualified as a glass and ceramics designer at Danmarks Designskole. She has her own glass studio, where she produces her own designs and experiments with different methods for working with glass. Despite her young age, she has already had quite a few exhibitions and has been awarded several grants and prizes for her unique, bold designs. Rikke Hagen has been associated with Holmegaard Glassworks since 2001. The delightful brand Ferm LIVING originates from a graphic design agency in Aarhus, Denmark and was founded by Trine Andersen in 2005. The company came to life after Trine, mostly for fun, decided to visit a clairvoyant. Trine was quite astonished when the clairvoyant saw a little bird sitting confused on a branch, not knowing which way to fly. This sight was essential for Trine’s decision to follow her dream of starting her own business. When she then founded Ferm Living, the little bird knew exactly where to go and now sits on top of the company logo. Ferm Living aims at designing and manufacturing Danish interior design products with a graphic touch. The product range consists of wallpaper, WallStickers, textiles, and kitchen items such as cork trays, cork coasters and cork placemats. a large KIDS collection which includes cute cushions and mobiles. Harechair is the Dutch Furniture brand for which Ton Haas produces highly innovative chairs, the Coral Chair being one of them. Ton Haas is well known throughout the furniture industry for his work with an impressive list of leading international manufacturers. His career began at the School of Fine Arts in Arnhem, before completing his degree in England at Kingston Polytechnic in 1979. He gained membership into various design partnerships eventually opening his own practice in 1993. Since then he has lectured widely, won awards and had his work displayed in museum collections. The founders of Walnut & Walrus are a dynamic duo Kalle Svanström and Aisa Sverin. Kalle has worked in the fashion industry as an illustrator/Graphic Designer for the past 11 years. He has worked with high street to premium labels. Aisa has worked within the fashion industry as a Fashion Designer for more than 13 years. Walnut & Walrus vision is to combine a playful, artistic and fashionable approach to design with the most eco-friendly materials. All our prints are hand-illustrated. The kid's collection is made from 100% organic GOTS certified cotton and we produce our lovely products in Portugal. Verner Panton is considered one of Denmark's most influential 20th-century furniture and interior designers. During his career, he created innovative and futuristic designs in a variety of materials, especially plastics, and in vibrant colours. His style was very "1960s" but regained popularity at the end of the 20th century; as of 2004, Panton's most well-known furniture models are still in production. Flowerpot stands out as one of the simplest and most memorable of Verner Panton's designs. This item is expected to arrive in stock early May The black TowerChair is an exciting new Danish..
Design Letters melamine cups with the letters of the alphabet in black typography as designed ..
A super cute Elephant lithographic print by Olle Eksell. Environmentally friendly lithograph. .. This cute rose coloured Ferm Living play tent is the perfect secret hideaway for your little ones. T.. Looking for frames for your posters? Tired of conventional frames? well we have some exiting frames with the usual Scandinavian simplicity and ingenuity. Copenhagen base By Garmi is a studio specialise in graphics and interior design. By Garmi aims at creating beautiful, aesthetic and sustainable illustrations. By Garmi's illustrations var..
Wrong Studio Copenhagen is a creative design studio. Skandivis stock the Wrong Geometry graphic posters. .. Architect Maja Bøgh Vindbjerg is the woman behind the super cool NUR. The Danish brand is all about classic and functional design. Less is definitely more as you are about to find out. ..